The Scary Snowman surprises pedestrians on South Street. As someone who lives on South Street, I see things that freak me out every day; all you really have to do is look in a store window. So I'm not sure that a snowman that moves and talks would take me by surprise. Obviously, however, that's not the case for everyone, as evidenced in the below video. 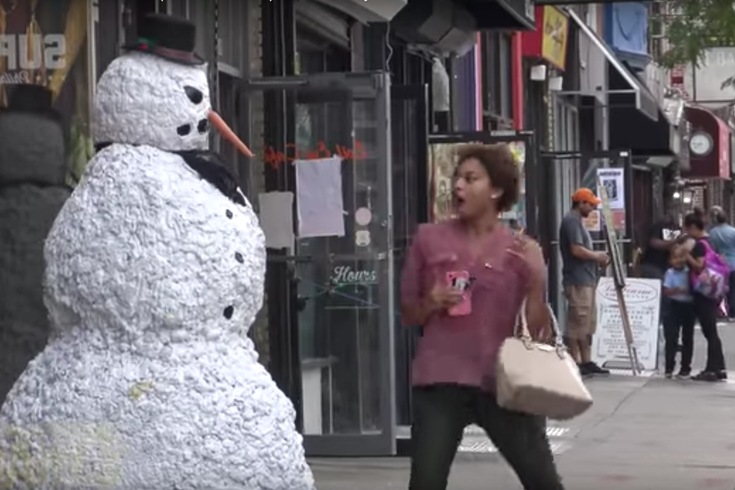 The Scary Snowman has been spooking people across the country since 2011, and in late November, the YouTube channel published its scare session from out front of the Suplex store on South between Seventh and Sixth streets. Notably, two of the snowman's victims are Eagles players Bryce Treggs and Byron Marshall, who can be seen around the 1:00 mark (h/t to our Eagles writer Jimmy Kempski for pointing out).